On Call for Vote at UN on Libyan Al Megrahi, Amid UN Scandals, Will Obama and Susan Rice Act? UNITED NATIONS, August 22 -- Ten days after U.S. Ambassador to the UN Susan Rice touted the Obama Administration's quiet diplomacy from within the UN, "getting things done," New York State Senator Chuck Schumer called on Ms. Rice to introduce a resolution condemning Libya's hero's welcome for Abdelbaset Ali Mohmed al Megrahi, released after conviction for the Pan Am bombing over Lockerbie, Scotland. Libya has a seat on the UN Security Council with Rice, and a Libyan diplomat is slated to take over the presidency of the UN General Assembly next month. Comment was sought from the US Mission to the UN, but four hours later, none had been received. Schumer's call may put Obama and Ms. Rice in an uncomfortable position. As al Megrahi was being released, Obama urged Libya not to celebrate his release, tied to his terminal cancer, but rather to confine him to house arrest. But the celebrations were televised around the world. Obama, who has yet to visit the UN in his seven months in office, is slated to be present for three days next month, on nuclear disarmament, climate change and for the General Assembly, now to be presided over by Libya. In a speech at New York University on August 12, Ms. Rice intoned that "Today, as we steer a new course at the United Nations, our guiding principles are clear...We work for change from within rather than criticizing from the sidelines. We stand strong in defense of America’s interests and values, but we don’t dissent just to be contrary. We listen to states great and small. We build coalitions." 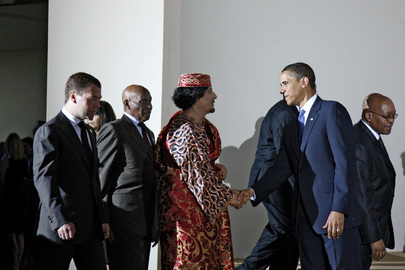 Will the U.S. build a coalition at the UN concerning Libya? Some contrasted Ms. Rice's speech to notable watering down of the statement on Myanmar's imposition of 18 more months of house arrest on democracy leader Aung San Suu Kyi, to which China added sections deferring to Myanmar's sovereignty and even the mercy it showed. Now that Scotland and Libya have shown mercy and respect for al Megrahi, what sort of statement will issue from the U.N.? Will Ms. Rice introduce the resolution Schumer and others have called for? Perhaps the strategy will be to have UN Secretary General Ban Ki-moon release a statement, which would not require any vote in the Security Council or General Assembly. In her August 12 NYU speech, Ms. Rice referred to Ban Ki-moon only once, saying that "our priorities are greater transparency and accountability, stronger ethics and oversight mechanisms, and buttressing Secretary-General Ban Ki-moon’s initiatives to overhaul the UN’s procurement and human resources practices." At the time, Inner City Press questioned Rice's seeming failure to meaningfully raise or push for reform at the UN, where simply in the field of human resources a number of nepotism scandals were erupting. Ban Ki-moon's envoy to the Congo, Alan Doss, was exposed by Inner City Press as asking the UN Development Program to show him "leeway" -- that is, to bend the rules -- to get his daughter Rebecca a job. Even Ban Ki-moon, through his Deputy Spokesperson, called the allegations "series" and said he expected to receive a report upon his return to New York, which took place on August 18. The US Mission has yet to comment on l'affaire Doss; a response has now been sought. Ban himself is seen by some as conflicted in responding to nepotism, given his administration's paranoia and lack of transparency about the hiring of his son in law Siddarth Chatterjee first by the UN in Iraq, and now by the UN Office of Project Services in Copenhagen. Most recently, Ban's son in law has made legal threats to get stories about his hiring and qualifications removed from the Internet. The US, sometimes described as the home of the free press, has yet to speak on the appropriateness of the UN Secretary General's son in law seeking to censor media coverage of questions of UN nepotism. Other countries' Missions to the UN, meanwhile, have been more vocal in calling for improvements at the UN. From within Norway's Mission to the UN, that country's deputy ambassador to the UN Mona Juul wrote a memo criticizing Ban's performance on such issues as Myanmar and Sri Lanka, and even climate change. The memo speculated that the UK's John Holmes might take over the UN's Department of Political Affairs from Lynn Pascoe, a Bush appointee. So what is the U.S. doing at and about the UN? Watch this site. NEW YORK, August 19 -- Veering from issues of no bid contracts and corporate background checks, four candidates New York City Comptroller were asked by Inner City Press on Thursday morning if in investing City funds they would bar or penalize companies engaged in predatory lending, or which do business in Sudan, Sri Lanka, Burma or Iran. This being NYC, and all four candidates Democratic members of the City Council, the answers ranged from "yes" to "of course," with a few differences. Melinda Katz said that seven years ago, she proposed such a ban on companies "having anything to do with Hamas or Hezbollah." She added that when current Comptrollers Thompson and DiNapoli proposed divestment regarding Sudan and Iran, she applauded them. All four which she named are Islamic, unlike Burma and Sri Lanka were which asked about but ignored. John Liu also avoided mentioning the two Asian countries, along he answered generically about human rights violators. He expanded the question to companies with abusive human resources practices, and those which took Federal bailout funds and still pay huge bonuses to their executives. David Weprin said he was an early proponent of divestment in Sudan and Iran, based on genocide and terrorism respectively. He cited the precedent of the campaign against apartheid. He also reminded the audience that under Mario Cuomo he was a deputy superintendent of banks for New York State, and required in-state checks to clear in three days. David Yassky, who began the morning's debate by touting his endorsement by Felix Rohatyn, said he sponsored a ban on Sudan, and co-sponsored one on Iran. He said that the City should invest in companies whose profitability came from such places. As such, at least he admitted all moral decisions cannot be defended as economically best as well. Similarly, to an audience of human services professionals, he said that he is against member items in which Council members direct funds to specific groups. The event, held in the auditorium of PricewaterhouseCoopers on Madison Avenue, was co-sponsored by the United Way and the Human Services Council, and the other questions were focused on how slow the City is to disburse contract awards to non-profits and how burdensome the City's VENDEX background check is. John Liu joked that the audience seemed tired because they'll stayed up the night before filling out VENDEX forms. There was polite laughter and then the event was over. Footnote: back in December 2007, Inner City Press put a similar question to Adolf Carrion, who had just announced he would run not for Mayor but Comptroller. Carrion said he would "also take into consideration the return for pensioners" -- click here for that story.